You are here: Home / Great Deals / Christmas Deals / Christmas Light Exchange! Home Depot had a Christmas Light Exchange a few weeks ago I told you about. well, if you missed that one and need another – here you go! 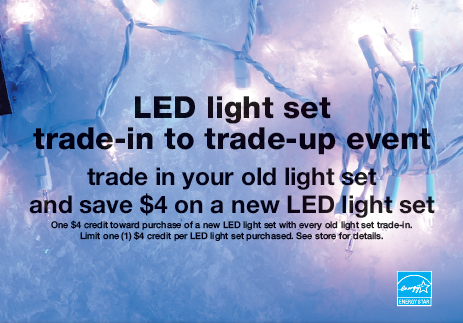 Sears & KMart are having a Christmas Light Exchange. 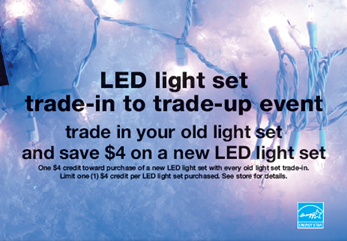 You will get $4 for every incandescent light set you bring in to them! This offer is good thru November 20th – so, hurry! I just called the store near me to find out what the limit was and believe it or not it is “trade 1 set in per person”. This does not seem to be worth it. Sears down in Houston have not even heard of this program..??!! Rick Green » That was a post from 2010.